TOKYO (Reuters) - After three decades building an airplane from scratch, Michimasa Fujino, 56, chief engineer of the Hondajet, might have to reach a ripe old age to see Honda Motor Co's <7267.T> pet aviation project recoup its development costs. Honda has declined to reveal the costs, but the automaker has been researching aircraft development since 1986, and Richard Aboulafia, vice president of analysis at aerospace consulting firm Teal Group, thinks it has likely spent roughly $1 billion on the jet program since the early 2000s - more than double the $400 million typical for similar jets. The company that gave the world the Honda Civic, which revolutionized compact cars in the United States in the 1970s, is betting its $4.5 million dollar, six-seater light business jet, the first aircraft developed by an automaker since World War Two, will expand the fuel-efficient private jet market. The jet began deliveries in late 2015 and is priced slightly higher than competitors in the conservative light businessjet segment. "The biggest mistake people make when getting into the aircraft business is (thinking) that the cash hemorrhaging ends once you start delivering aircraft," said Aboulafia. "But very often, it increases," he said, citing marketing and production ramp-up costs. Fujino, CEO of Honda Aircraft Company, has said he expects it will take at least five years to start generating profits, and Aboulafia thinks it could take much longer to recoup sunk costs. "If they, miraculously, can generate $1 million in profit on each aircraft, then they need to sell 1,000 planes, after they build the (first 100 or so) aircraft that are unprofitable," he said. The project has depended on Honda's deep pockets. The automaker's net profit for the 2016 financial year was around $3 billion, more than triple that of Textron , maker of the rival Cessna Citation M2 jet. Honda hopes the project will have intangible benefits - varnishing its brand image to claw back automobile market share in North America, which has slipped below 10 percent in the past few years, and leveraging jet-engineering skills to raise the efficiency and performance of future car models. Fujino acknowledges that customers, particularly first-time buyers, may need convincing. "We want to show customers that even though we don't have a history of selling aircraft, we're in the market because we have something new to offer," he told Reuters in an interview. "For us that's more important than having a track record." Businessjet operators have shown interest, as it would offer an upscale alternative to turbo prop jets, often used for small charter services. "The Hondajet would provide a new product for that segment, which is now mostly rattling around on old turbo props," said Richard Hodkinson, vice president of aircraft sales and acquisitions at aircraft services operator Clay Lacy Aviation in Van Nuys, California. "It wouldn't be bigger than a turboprop in terms of the cabin, but it would be new, it would be quiet, it would be more efficient, and you'd be in a jet." To sell the jet, Honda, which is targeting wealthy individuals and business owners, has taken a page from the auto industry playbook, establishing a dealership network across the Americas and Europe, though it plans to sell directly to fleet operators. "The car dealership model works for achieving high-volume, localized sales. The model may not be perfect, but Honda U.S. car sales have expanded by leveraging the strengths of the dealer system," said Fujino. Some think that could be a mistake. Established makers often sell directly to customers and offer maintenance and parts services through their own sales outlets, which takes time and resources to establish, but enables them to control quality and consistency of service. "You can't transfer the dealership model from the auto industry to aircraft," said Aboulafia. "You're sending a message that you're not going to be a big player ... If they want to develop a family of products and really get out there and be a force in the market, then it's a missed opportunity." 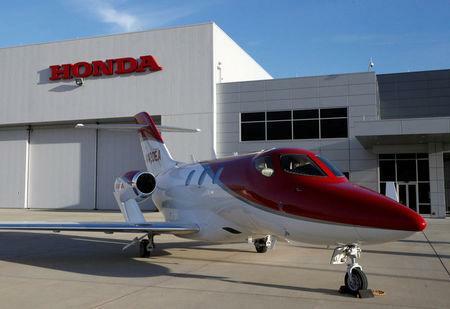 Unlike the cheap-and-cheerful Civic, the Hondajet is marketed like an expensive sports car, presented on a slowly rotating platform in the company's delivery room, a pristine, high-ceilinged hangar at its headquarters in Greensboro, N.C.
"The Hondajet is meant to evoke the image of being the sports car of business jets. We wanted it to have the 'wow' factor of a beautiful car," Fujino said late last year. The jet has been a labor of love for Fujino, who confounded industry colleagues with the craft's engineering masterstroke: engines mounted on the wings, not the fuselage, which reduces cabin noise and makes space for a full-sized washroom, a first in its segment. He also says he found an aerodynamic sweet spot for the engine placement, helping the jet use an average of roughly 15 percent less fuel than rivals, which include the Phenom 100, made by Brazil's Embraer SA , and the Citation M2, its biggest competitor. In the delivery room, Fujino obsesses over every detail of presentation, angling the lighting to highlight the contours of the aircraft's softly pinched nose, inspired by a Ferragamo stiletto. He often personally hands over the keys to new owners and says he intends to keep that up even as annual production rises from around 25 now to perhaps 80 in the coming years, nearly double the Citation M2, according to Teal estimates. "I know the faces of all of our current customers," he said.